When I was in college, I had a full kitchen in my dorm. It allowed me to cook whole meals instead of the typical college diet of microwavable foods. It also meant I needed an entire set of kitchen items: pots, pans, baking sheets, and dishes. Since the freshman kitchens had limited counter space, I set out to find compact kitchen awesomeness. 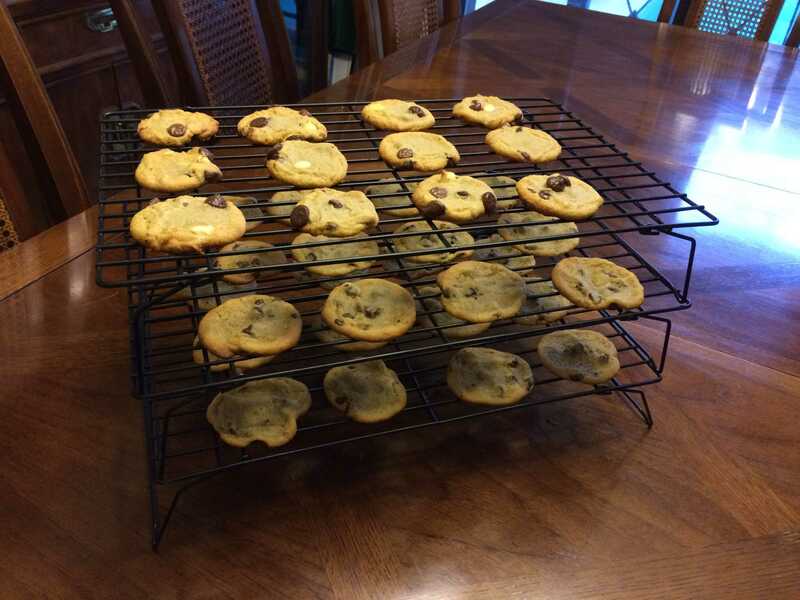 I knew I’d bake cookies frequently, so I needed cooling racks that would fit on our counters. Luckily, I found these stackable cooling racks. I never realized how much I would love these stackable cooling racks. Even now, almost ten years later, I use these regularly for my baking projects. Eventually, we’ll remodel our kitchen, but we currently have a galley-style layout without much counter space. Instead of finding counter space for three dozen cookies, I use the stackable cooling rack to save space. Each tier holds a dozen normal cookies, so it’s easy to know how much I have baked. They are also a great size for cooling 8- or 9-inch rounds before frosting a cake. The cooling racks stand about 2 ½ inches high, which allows room for each round in between. The legs of the cooling racks fold down for easy, compact storage. I store mine next to our cutting boards in a cupboard. Depending on how much space I need, I snag one or all three. If you want something that has the same functionality but is a bit higher-end, try the professional grade cross grid, stackable cooling racks. They’re better for smaller cookies or pastries so they don’t fall between the wires of the racks. You’ll spend about twice as much, but it’s worth the money if you’re a serious baker. For the occasional cookie and cake maker like me, the cheaper option works just fine. I hope you try these out and save some space on your counters for other yummy food. I love them. Have you found a stackable cooling rack that you like? Let us know about it in the comments. We’d love to take a look at it and any other kitchen gear you recommend. Happy baking!